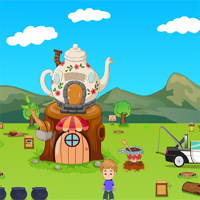 Coffee Cart Escape is a point and click escape game from games2jolly family. Usually kids are always eager to play games which gives them fun. There are some kids who like to play games which helps them learn something better like business or math and maany more. Here a boy built himself a Coffee Cart which he filled with some brown liquid that looks exactly like coffee. For gamesake he sells the coffee to the neighbouring kids. While he was pushing the cart it got struck in the mud unfortunately.